Belgrade doesn't have Uber, but it does have the local version known as CarGo, which is likely the safest, cheapest and most convenient way to get across town and especially to or from the airport. Read more here. As a result of a surprisingly small number of bridges, a bypass under construction, and the fact that a motorway runs almost through the centre of the city, there are no classic peak traffic periods, but instead, there are traffic jams on major interchanges almost all the day round. Belgraders as a rule drive fast and change lanes abruptly without signalling, and they do not suffer slower drivers gladly. A yellow line which marks the rightmost lane actually means the lane is reserved for public transport and taxis. Do not come too close to the curb, because some mysterious bandits seem to be operating outside the city centre and targeting manhole lids, so you run the risk of your tyre hitting the hole. In summary, if you have little penchant for the Dakar Rally experience, you have better abandon the idea of driving round Belgrade. After all, the best way to get to know a city is on foot. 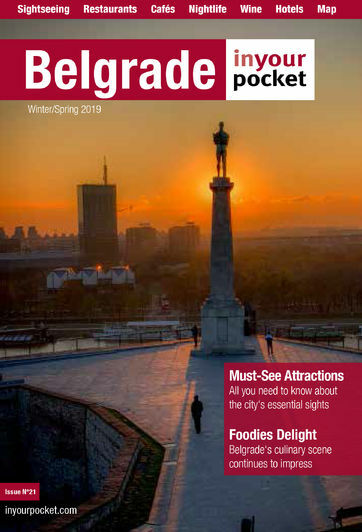 If you don't mind public transport, we recommend hopping on a bus or trolley in order to truly experience candid Belgrade. All public transport use a Bus Plus card payment system, so it would be smart to invest in one before hopping on a bus, in case of the rare occurrence of controllers. A lot of the locals don't even bother using this payment system though and talk their way out of paying the fine. Foreigners however, might have even be overcharged for riding without a ticket, so watch out. Taxis in Belgrade are comparatively cheap to the rest of the world, but only if you choose wisely. Avoid getting into "unregistered" taxis (with plain white taxi signs) at all costs, as they are notorious for ripping off their customers more than ten times the usual price. To stay on the safe side, always call a taxi to ensure that they are valid. Our recommendations are Lux Taxi, Pink Taxi and Plavi Taxi. Most vehicles don't offer card payments, so make sure to ask for one while booking. Parking presents a problem. There are very few parking garages, and only a few companies can boast the luxury of private parking. To compound the mess, the Old Town is divided into three parking zones: red zone (one-hour parking limit), yellow (two-hour) and green (three-hour). You can pay for parking by filling out a parking coupon for the relevant zone, available at kiosks with instructions in English overleaf. Another way to pay for parking is to send an SMS message with the number of licence plates to 9111 for Zone 1, 9112 for Zone 2 and 9113 for Zone 3. You will receive a confirmation message in Serbian, so it might be safer to use the parking coupon, in case you were rejected. If you opt for parking in a parking garage, no parking limit applies. You may notice that some local drivers have a habit of parking their cars with blithe insouciance in the middle of the street, even in the yellow lane, reserved for public transport, without suffering any consequences. This occurs with annoying regularity on Nušićeva, Kraljice Marije, 27. Marta, Svetogorska and Bulevar Kralja Aleksandra among others. We do not advise you to follow their example because it is an ugly habit, posing a problem for other drivers. Belgrade does not have an underground railway system, and it does not look as if it is going to get one soon (although it has one of the deepest tube stations in Europe, at 42m below ground level). City transport comprises buses, trams and trolley buses. Buses are operated by a public utility company controlled by the city council and a number of private companies, which accounts for the differences in shape, colour and age of the buses out on the streets. The best option for paying are the newly launched BusPlus tickets, which cost 100 dinars and are good for 75 minutes with unlimited connections on buses and trams. There are also single-ride tickets for 72 dinars, or you can buy a fare on board from the driver for 140 dinars. You have to validate your ticket once you get on board. A ride without a valid ticket could cost you a 3000 dinar fine. Public transport runs (roughly) from 04:30 to 23:30. During night time, buses run at 1-hour intervals. Night buses depart from special stops on Trg Republike towards other parts of the city. The night fare is 100 dinars, available on board. You are advised to avoid trams if you are in a hurry, because one broken tram blocks an entire line (or two), and this invariably happens right in the middle of two stops, in pouring rain. Like most things in Belgrade, taxis have become a bit more modern and reliable in recent years, and are still quite cheap by western standards. Like anywhere in the world there are a few bad apples who might try to run up the fare on you or engage in some other dubious activity. However, from our personal experience the average Serbian taxi driver will go out of his way to get you where you're going as quickly as possible, whilst expertly negotiating Belgrade's often chaotic traffic. Most drivers are not exactly fluent in English, but are more than happy to chat with passengers as much as possible – and any Serbian vocabulary proffered on your part is sure to impress. Tips aren't the norm, but with the low fares and frequent en route entertainment we recommend paying it forward as much as your budget allows. All reputable companies are part of the local Taxi Association, with standard fares set at 170din flag drop, 65/85/130din per kilometre depending on the time of day, and 750din per hour of wait time.